DUBAI ? K-pop and K-drama had already penetrated into the Muslim community in Dubai, the United Arab Emirates, but Korean cuisine hadn’t had the opportunity to do so, due to the great distance between the two countries and unfamiliarity with Korea. The K-Food Fair held for the first time in Dubai, Friday, was an opportunity to introduce Korean food to citizens living in the Arabic country. Hosted by the Ministry of Agriculture, Food and Rural Affairs (MAFRA), the fair was held for three days at Jabeel Park in Dubai. The fair included a one-day event for Korean exporters and local importers and a two-day event introducing Korean food to the local public. 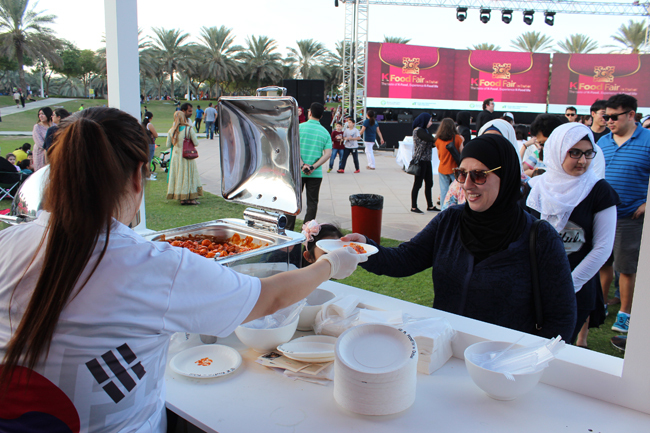 The interest among Dubai citizens in Korean food was heated as 20,000 people lined up in the park to grab a bite of the Asian food that was new to them. For many, it was their first time trying Korean food. The food introduced at the fair included tteokbokki (spicy stir-fried rice cakes), japchae (stir-fried noodles with vegetables) and various Korean snacks prepared by Korean companies. “It’s my first time trying Korean food but it’s really good. I ate japchae and I tried to get tteokbokki but the line was too long so I didn’t get to try the latter,” said Lubna, a participant at the fair. “I learned about Korea through Korean TV dramas. I’m also a big fan of K-pop. I like groups such as SHINee and Super Junior,” she added. Other than offering Korean food, the fair offered cultural programs such as a chance to dress up in hanbok (Korean traditional dress), a dart-throwing (tuho) game, and dancing to K-pop. The K-Food Fair in Dubai comes after the Korean government signed a memorandum of understanding with the Arabic country in March this year regarding halal food. Dubai agreed to cooperate in easing and shortening the complex halal food certification process. It usually takes three months to receive certification. Twenty-two Korean food companies participated in the fair to reach local importers. Five of them received a halal certification trophy from the Emirates Authority for Standardization and Metrology (ESMA), the authoritative agency providing halal certification in the country.